Park opens at 8 a.m. and closes at dusk daily, year round. See what's happening at Deep Cut Gardens by visiting our In the Garden page. Visitors are urged not to leave valuables in their cars and to notify Park Rangers of any suspicious activity in parking lots. To reach a Park Ranger, contact the County emergency communications center at 732-577-8700. Deep Cut Gardens is dedicated to the home gardener. 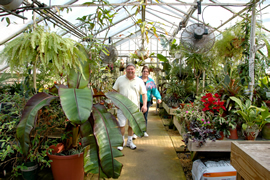 The 54 acres of gardens and greenhouses are planned as a living catalog of cultivated and native plant materials to be observed through the seasons. 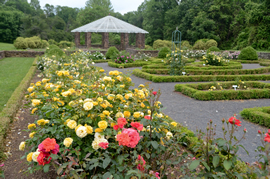 Our renovated Parterre features 52 varieties of roses with over 180 bushes. Discover new ways to improve your home garden by taking a walking tour of the park, ask the staff horticultural questions, or visit the reference library. Garden programs and classes are also offered. 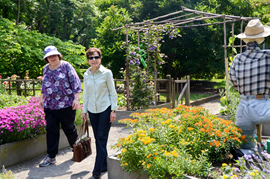 Visit our Programs & Registration page to see our Deep Cut Gardens offerings. 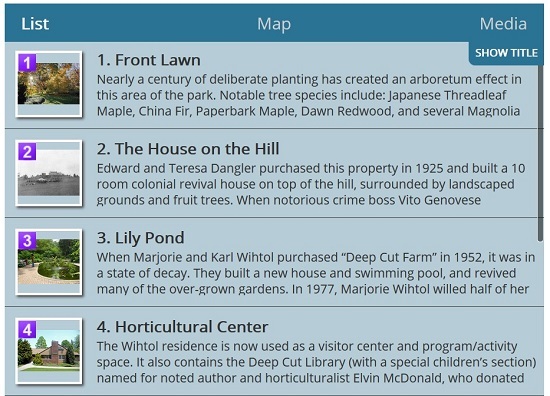 Our Story Map highlights key features and plant life, and describes the context of the historic landscape of Deep Cut Gardens as it developed over time. 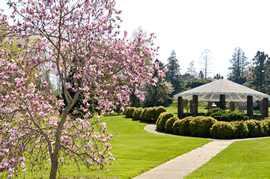 These gardens are now used as an educational experience for the public to explore plants, horticulture, and landscape planning. Visit our Story Map. Calling all gardeners! It’s fun, free and easy. Bring plants in one-quart, one-gallon or two-gallon containers to exchange for plants in like sizes. Please label all plants. Herb and vegetable seedlings may also be exchanged. Please check the FoHVOS website for a list plants that will not be accepted. For more information, call 732-671-6050. 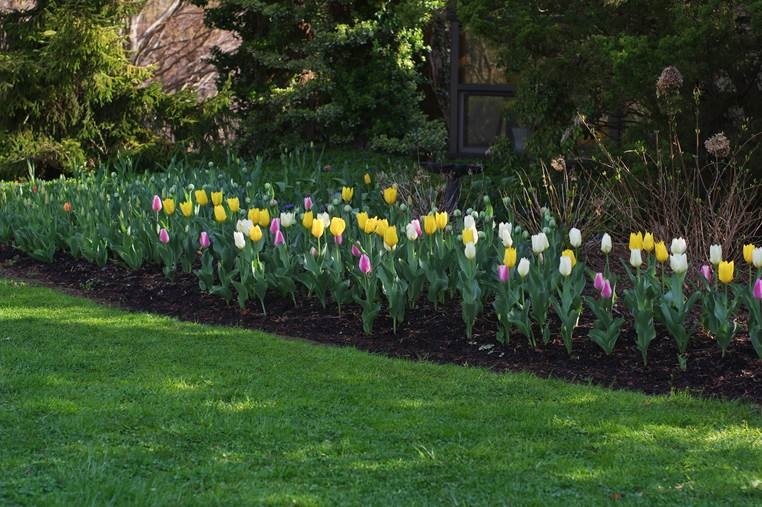 Saturday, May 18 from 12-4 p.m.
Join Deep Cut Gardens and Garden State Iris Society for a special day celebrating irises! The event includes demonstrations conducted by Garden State Iris Society members, children's activities, and an iris flower show. This American Iris Society affiliated show includes both single flower categories and arrangements. For guidelines, please visit GSIS website. Amateurs are not only welcome, they are encouraged to compete! Iris Society members will even help identify your cultivars to help you participate. Show exhibitors set up between 10 a.m. and 11 a.m. Judging is from 11 a.m. -12 p.m. The event is open to the public from 12-4 pm. Admission and parking are free; no pre-registration required. Saturday, June 8 from 8 a.m. to 4 p.m. 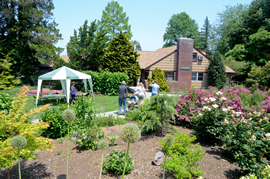 Celebrate Deep Cut Gardens, your community treasure! This wonderful park is in full glory with displays and gardens in full bloom. 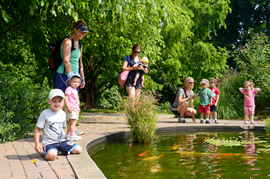 The event features tours, a gardeners' helpline conducted by the Master Gardeners, demonstrations by local plant societies, drop in activities for children and more. FREE! Saturday, June 29 from 10 a.m.-2 p.m. The Monmouth County Park System and the Garden State Daylily Growers present Daylily Day at Deep Cut Gardens. View daylily displays and chat with experts on hand to answer questions. Come enjoy our large selection of daylilies on the grounds. FREE! Set out on an exploration of the gardens! Each backpack contains all you need to help you and your family discover new ways of seeing living and non-living features of the gardens. Available daily from 10 a.m. to 4 p.m. at the Horticultural Center, on a first-come, first-serve basis. There is no fee, but you must leave your valid NJ driver’s license with the docent. For more information, call 732-671-6050. Garden State Parkway to Exit 114. Southbound, turn left onto Red Hill Rd; northbound, turn right onto Red Hill Rd. Make right at light to Dwight Road and then left back onto Red Hill Road. Follow Red Hill Rd. (1.5 miles) to Deep Cut. Entrance on right. State Hwy 35 Southbound, follow to Kings Highway, turn right. Follow Kings Highway to first traffic light. Turn right onto Red Hill Rd. and continue to Deep Cut entrance on left. State Hwy 35 Northbound, make right at the New Monmouth Road jughandle and take back over Hwy 35. New Monmouth Road to stop sign and right onto Kings Highway to traffic light and left onto Red Hill Road. Continue to Deep Cut entrance on left.